Times of India: How did gunmen evade the entire security establishment? The Telegraph: Taj hotel standoff became "embarrassing"
(CNN) -- Three days after gangs of gunmen launched a murderous rampage in Mumbai, India, killing at least 183 people, the emphasis in the Indian media has quickly turned from shock to anger and recrimination. 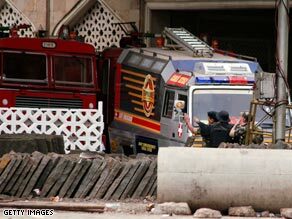 Security forces gather outside the Taj Mahal hotel in Mumbai during the siege. The Delhi-based Times of India questioned the country's lax security in the wake of the deadly attacks. It asked: "How did terrorists -- at least 20 of them -- seem to have come in rubber dinghies and evade the entire security establishment? "Clearly, our long coastline dotted with ports, oil rigs and tourist resorts is a porous border." India's financial daily, The Economic Times, asked whether "India's 9/11" was a wake-up call? It said: "Just as the images of billowing smoke from the twin towers of New York are seared in the memories of people all over the world, similarly the television visuals of the raging fire in the ornate façade of Mumbai's iconic Taj Mahal Palace and Tower Hotel will be recalled whenever the deadly terrorist attack on India's financial capital is mentioned." Referring to the new strategy of using gunmen in direct attacks on the city, it asked: "Is it possible that the terror groups had realized the diminishing effect of their earlier tactics of planting bombs in crowded places and vehicles?" The Telegraph in Calcutta bemoaned the apparent lack of information available to the authorities on the ground in Mumbai which culminated in "the embarrassing daylong standoff at the Taj that left the twin successes at the Oberoi-Trident complex and Nariman House stained." The terrorists, it added, were able to tease the security forces with "alarming aplomb" as they "crossed corridors, jumped floors and weaved rings round army platoons, NSG commandos and all their assorted comrades in arms." The Hindustan Times focused on the news that Prime Minister Manmohan Singh has convened an all-party meeting in an apparent move to get consensus on a tougher anti-terror law and a federal agency. It said the meeting comes at a time when the opposition was targeting the Congress-led coalition government for not being serious about tackling terror. "The government's nonserious approach is reinforced by reports that the Mumbai attackers arrived in the city by the sea route," Senior BJP leader L K Advani was quoted as saying. The Deccan Herald, meanwhile, looked at the possible involvement of Pakistan and its intelligence agency, ISI, in the attacks and said that the government in Islamabad cannot avoid responsibility "if persons of Pakistani origin or organizations that operate there are behind the attack." It added: "The fact that Pakistan also has seen terrorist outrages is no mitigating factor. The ISI is not under the control of the civilian government in Islamabad, and assurances on curbing anti-India activity within Pakistan, given to India by successive leaders of that country, have not been kept."